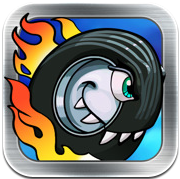 When violent racer Death Rally hit the iTunes store it created a kid of resurgence in racing titles that emphasize more than just first place. One of those games is Chillingo‘s Mad Wheels. Created as a top down racer and built with destruction in mind, racers will find that Mad Wheels is both simpler and easier than the Death Rally title that inspired it. 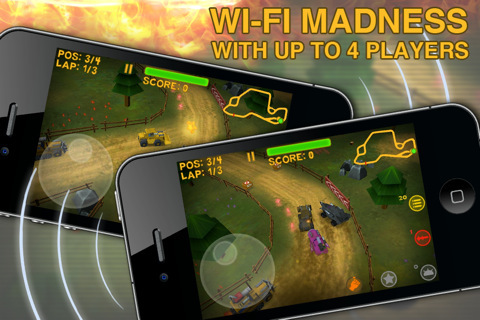 The game itself is divided into Championship Mode, Quick Race, and Wi-Fi Game (where racers can compete through a wireless network). Championship Mode, which is divided into multiple levels in four different worlds, is where gamers are likely to spend most of their time. 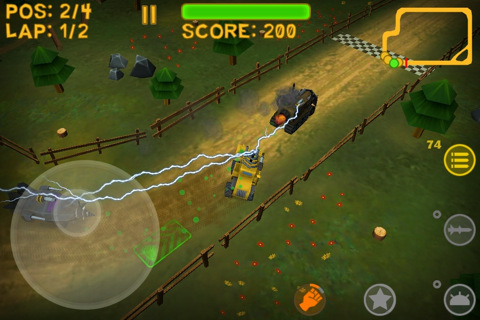 Racers choose between cars with varying amounts of armor, acceleration power, and handling. Then they hit the racetrack where destroying fellow racers is as important as crossing the finish line first. Add to this a health bar that determines your own fate and this racer is suddenly much more involved than your typical track game. 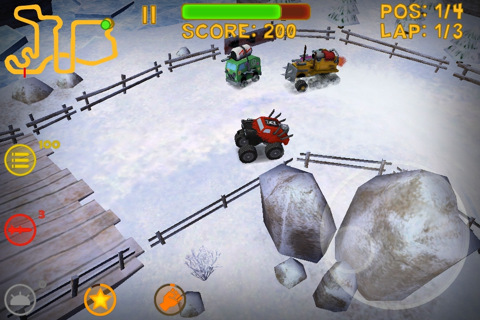 Mad Wheels is structured so that most of the game occurs on the fly. Between levels users are informed of new weapons upgrades, but beyond that all ammunition and med kit health boosts are acquired by rolling over power ups on the track. 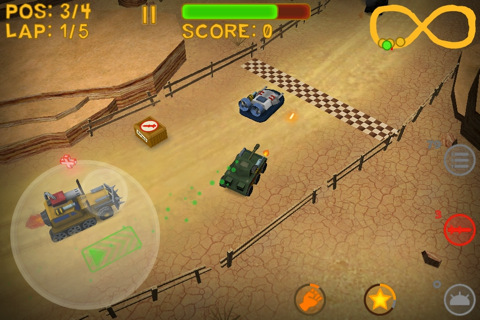 Small buttons set the weapon into action against the enemy and the actual controls for moving your car are all in the power of a single directional joystick. The result is a decent use of a small screen space, but it’s difficult to see where you’re headed unless you memorize the track or figure out how to look at the full racetrack map and drive without crashing. 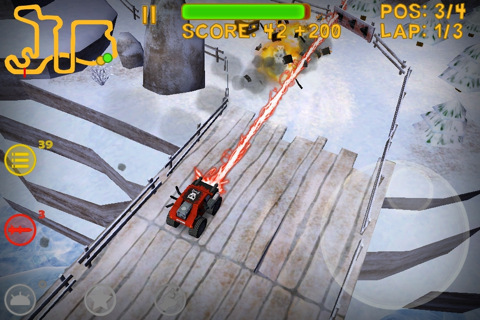 Each level gives gamers extra points for different objectives (e.g. kill a certain amount of opponents or lead for an entire lap). This adds a bit of variety to the game, but except for the fact that any decent racing game is incredibly addictive, there isn’t a whole lot that will keep gamers coming back to Mad Wheels. After all, players can’t upgrade the specs on their vehicles. Instead gamers unlock a few new cars over time as they gain access to new racetracks with points earned through objectives. The whole setup is fairly formulaic and not necessarily ground breaking, but the race tracks are shockingly long and the process of demolishing competitors with electro-rays and tractor smashes is incredibly appealing. The Mad Wheels AI competitors hardly ever veer off track so racers who want to compete have to dedicate time to mastering each track, but if Death Rally feels too crowded and dizzying, this is a perfect medium between heavy detail and pared down racing mixed with destruction. Bottom Line: Mad Wheels will get your heart pumping with its destruction approach to long form racing. This Death Rally knockoff isn’t perfect, but it provides a strong bang for your buck.